This review originally was posted over at Dollycas’s Thoughts December 22, 2010. Mel Cooper and Angie DeLaura, all of Angie’s brothers, Mel’s mom, and their evil bakery enemy Olivia Puckett, are all back in the second book of the Cupcake Bakery Mystery Series. Valentine’s Day is quickly approaching and the girls are teaching a couple’s cupcake baking class. During the first class Mel’s mom bursts in to announce she has a date! She needs Mel to take her shopping for the perfect “drop dead” gorgeous dress for her date. She hardly expected the dress to cause one man to have a heart attack and another, her date, actually “drop dead”, but that is exactly what happened. Only her date didn’t die of a heart attack or any other natural causes. He was murdered and Mel’s mom is in a deep bowl of batter as the number one suspect. Mel knows her mother couldn’t kill a fly let alone a man, so with Angie’s help they must take time away from their Fairy Tale Bakery to find the real killer without getting themselves baked or frosted. Jenn McKinlay has done it again, the cupcakes not only stirred my cravings but the mystery had me so captivated I couldn’t put this book down. I stayed up late and finished this book all in one sitting. I hate to give too much away but these characters, especially Angie’s new boyfriend, will keep you entranced and in stitches until the very last word. 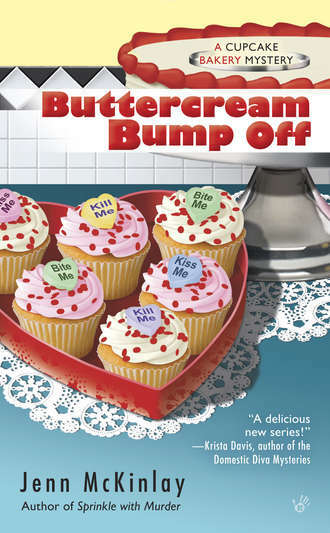 The cupcakes are just the icing on this wonderful delectable treat for your reading pleasure. A definite must read for the new year. Start the year off right with Jenn’s delicious cupcake series. BE SURE TO VISIT JENN’S WEBPAGE TOO!